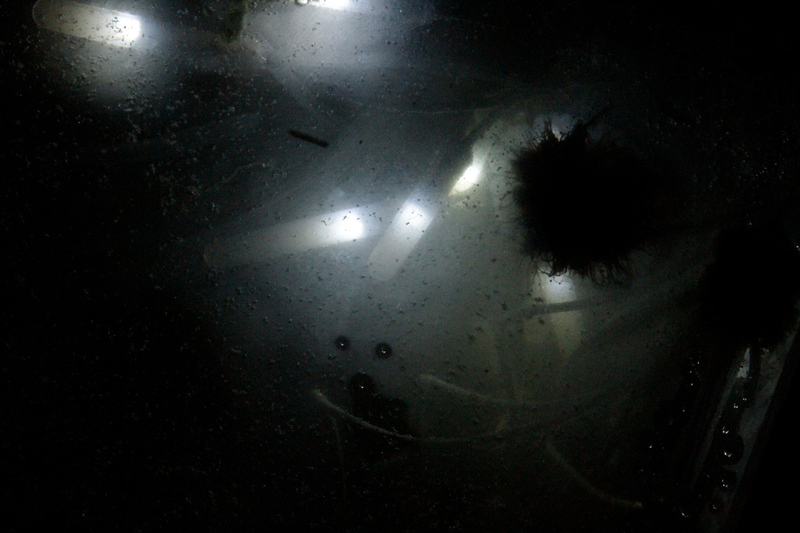 Plasmosis is a site-specific, underwater, artificial life installation. 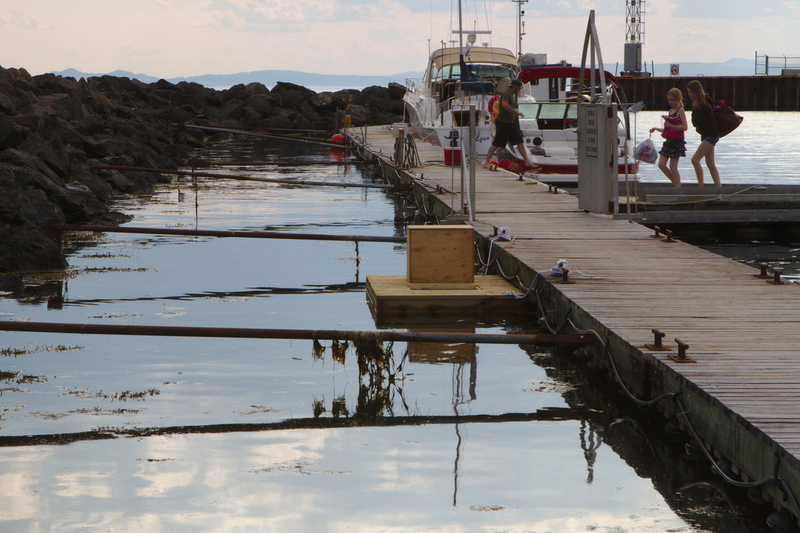 It was installed at the marina of Carleton-sur-Mer (Quebec, Canada) during the Summer 2013. An artificial entity, it interacts in the aquatic environment through multiple sensors, adapting over time to the different natural movements that surround it. The work is thus as a passageway between two worlds: that of air, and that of water. Situated at the point of phase change between liquid and gas, it allows the visitor to exist for a time between these two worlds, to assess their shape, density, temporality and limits. It raises questions about our relationship to the maritime area and its ecosystems. Plasmosis proposes to incorporate an artificial agent in a limit habitat. This simple addition destabilizes the living environment in which the work is located, fostering the emergence of a new equilibrium. This balance is not static: over the summer, physical and human changes will affect the location as well as the work, constantly reconfiguring both. The venue is in resonance with the work: the marina is an access point linking the city and the sea. The work is attached underneath a fake dock. 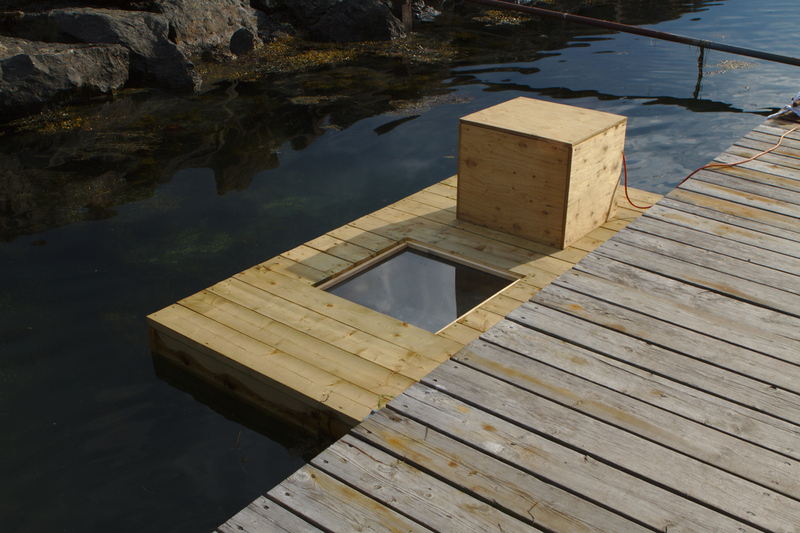 A plexiglass window allows members of the marina and visitors to observe its movements and reactions. 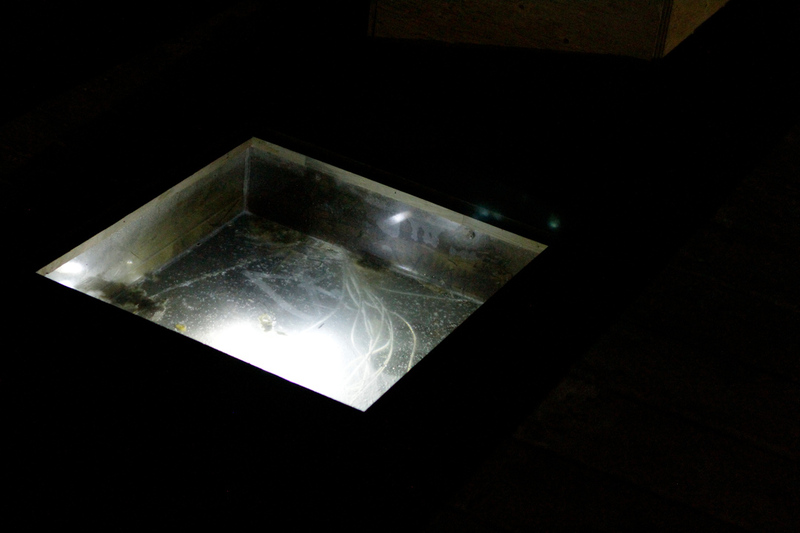 The light emitted by the installation attracts different sorts of animals, such as gammarus and jellyfish. An intriguing creature, halfway between the organic and the artificial, its presence causes reactions ranging from curiosity to anxiety. Among regular users of the marina, the relationship with the work evolve over the Summer as it will become more and more familiar. 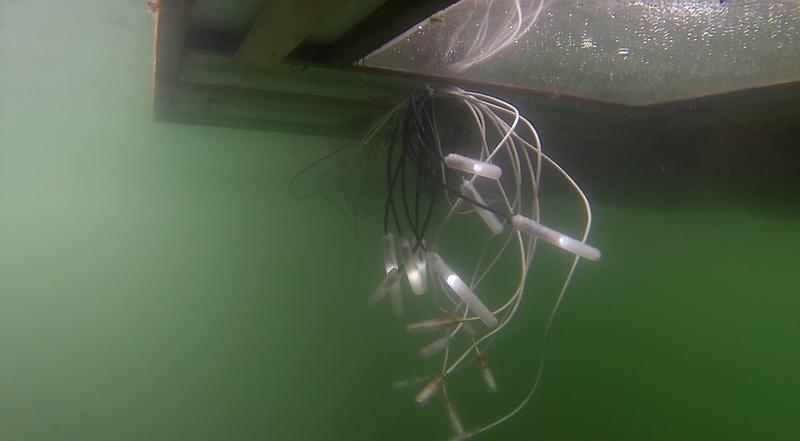 The installation consists of 16 submersible probes: 8 white and 8 black. At their tip, the white probes have an electrode that generates a low electric field and a photosensitive cell. A second electrode connected to a transistor allows them to create an electrolytic reaction while generating current variations underwater. Black probes are the exact opposite: they have an electrode that can sense electrical variations and an LED that can generate variable intensities of light. The probes act independently. They have a common mechanism, which is to convert their sensor data into a (virtual) form of energy that allows them to activate their actuators. White probes operate as accumulators. They collect energy in the form of perceived light. 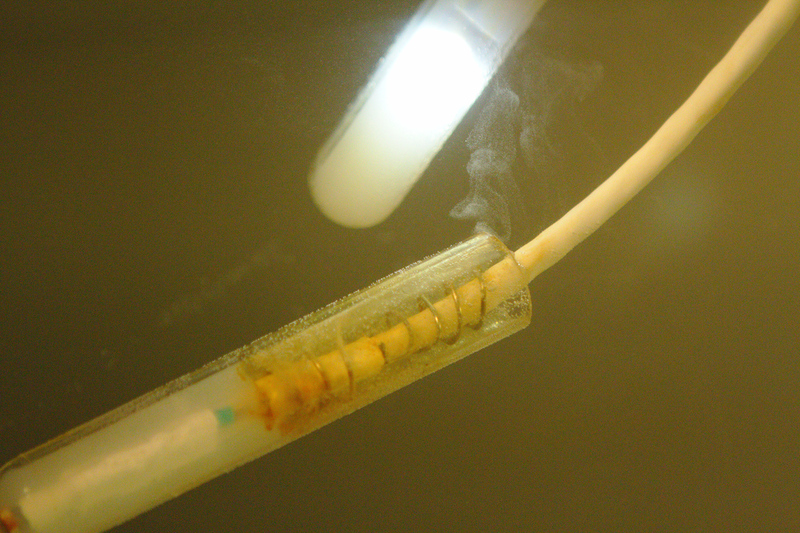 Once that energy reaches a given threshold, they release it by activating an electrolysis reaction. Black probes are more complex. Their energy comes from the potential drop induced by white probes during the electrolysis reaction. The lower the light they generate, the quicker they spend their energy reserves. Their behavior is dictated by a reinforcement learning algorithm coupled with an artificial neural network. They are motivated by a conflicting desire: they try to maintain a low light intensity while avoiding to completely deplete their energy reserves. When they are initialized, they have no knowledge of their environment and their actions are random. Through trial and error, they learn to stabilize themselves based on available resources and the consequences of their past actions. From time to time, on a regular cycle, all black probes enter a phase of scrambling that shows up as rapid blinking. During this phase, the neural networks are scrambled. This has the effect of destabilizing agents which start to act more erratic and exploratory until they stabilize again. These phenomena create a symbiotic coupling in constant negotiation, not only between the two types of probes, but also with the environment in which they bathe. Indeed, the environment's qualities, such as sunlight and water conductivity, influence the behavior of the agents. This dynamic coupling results in a global emerging phenomenon as the probes become, through their interactions, the components of a single entity. The work was produced and shown as part of the exhibition "Séjour temporaire | altérations provisoires"